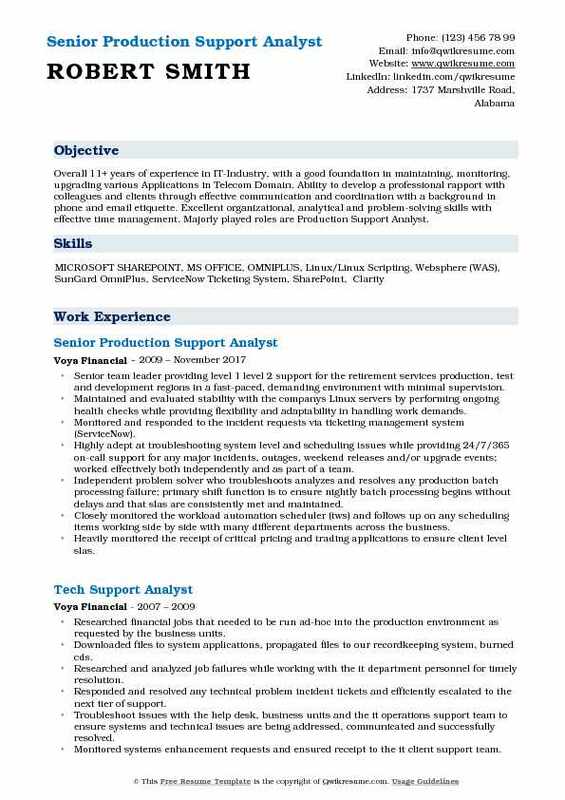 Production Support Analyst provides two-tier support by identifying the production issues and supporting the end users. 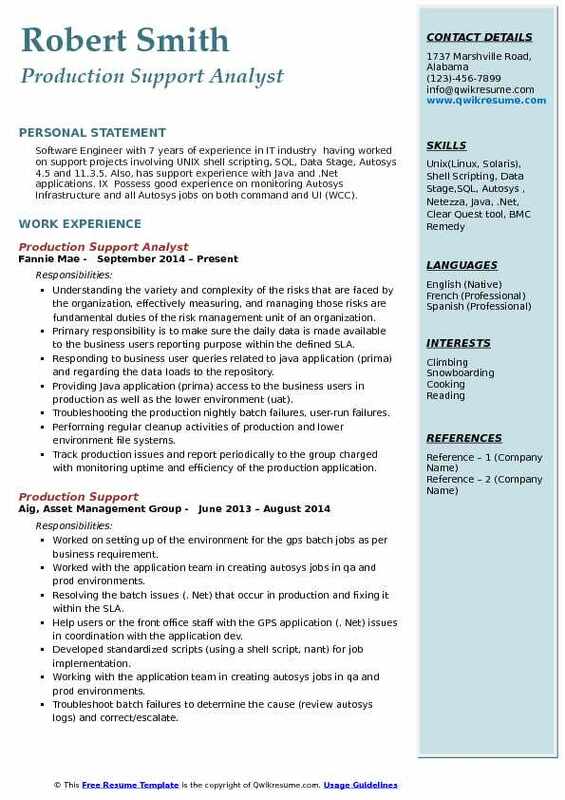 A well crafted Production Support Analyst Resume should mention the following job duties – analyzing vendor applications, providing operational support, administering and implementing new systems, ensuring transition of plans to production, documenting production applications, training new employees, monitoring performance metrics, preparing project requirements, developing associated projects for diverse applications, participating in weekly meetings to discuss appropriate strategies and maintaining all production applications. 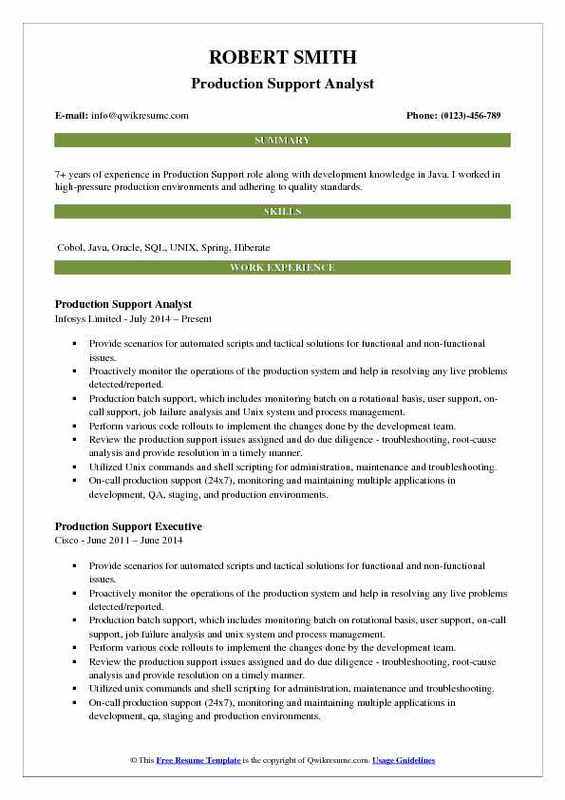 Those interested in a Production support analyst position should be able to demonstrate the following skills in their resume – knowledge of tools and technologies like SQL Server, Oracle, Net, MQ, Windows and UNIX operating systems and Informatica. Eligible resumes for this position make a display of a Bachelor’s degree in Computer Science or the related. Summary : Eight years of experience in the field of Information Technology with emphasis on Application support and Maintenance Projects. Extensive experience and knowledge in Telecom and Risk Management in Financial domain. Ensures 2nd line support requests, clarify tickets, ad-hoc queries, support to external applications are allocated within team and track its completion/resolution. Support aspen pcr, aspen sales reporting, scorpio, reference data store, icms, gm blotter and db raven applications. Partner with trade floor support colleagues to manage the production environment of applications used by investigating data issues. Develop expertise in the applications for multiple lines of business while taking ownership of the availability and quality of service by providing training to staff and businesses on application operation and maintaining efficient operation. Utilize geneos to monitor control-m cron jobs, server failures and messaging ques. Identify and respond to events that impact production and aid in resolving those issues; including technical resolution and management communication. Participate in disaster recovery planning and monitoring by testing applications on multiple servers to ensure the servers can handle the applications and the applications are mirrored on each server. Perform data mining activities utilizing proprietary software and application tools to audit users accounts for unauthorized activities and compliance issues using unix and sql. Accessed microsoft excel for daily project documentation and microsoft desktop on demand system for daily work usage. Provide consultative assistance to technical staff and business unit clients in recommending and implementing solutions to business problems. Gain detailed knowledge of all business flows, the application architecture and the hardware configuration for supported applications. Define, document and maintain procedures, slas and knowledge base to support the platforms to ensure consistent service levels are achieved across the global support team. Represents the team on p1, p2 and p3 calls and strive to resolve the issues and stabilize the application to ensure minimum downtime. 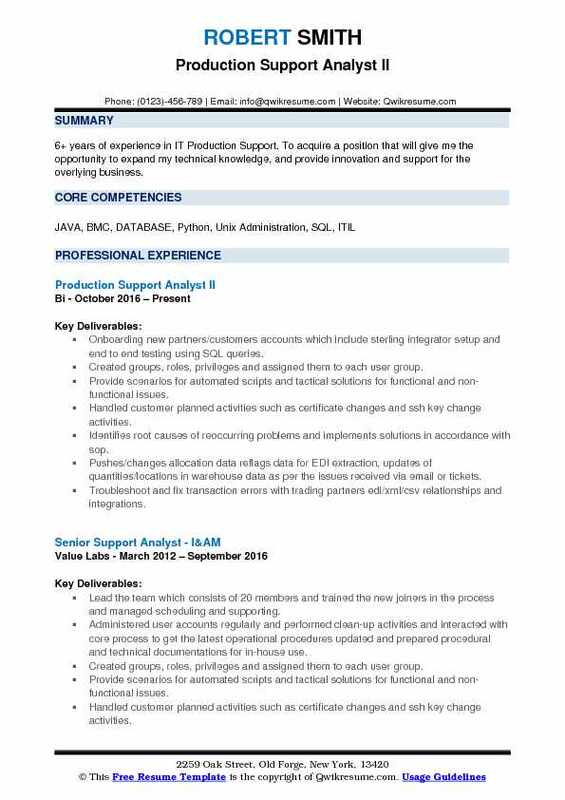 Headline : 6+ years of experience in IT Production Support. To acquire a position that will give me the opportunity to expand my technical knowledge, and provide innovation and support for the overlying business. Onboarding new partners/customers accounts which include sterling integrator setup and end to end testing using SQL queries. Created groups, roles, privileges and assigned them to each user group. Provide scenarios for automated scripts and tactical solutions for functional and non-functional issues. Handled customer planned activities such as certificate changes and ssh key change activities. Identifies root causes of reoccurring problems and implements solutions in accordance with sop. Pushes/changes allocation data reflags data for EDI extraction, updates of quantities/locations in warehouse data as per the issues received via email or tickets. Troubleshoot and fix transaction errors with trading partners edi/xml/csv relationships and integrations. Trouble-shooting day to day issues which comes through service now ticketing tool and providing a root cause and fixing it. Contact customer and/or organizations to identify edi requirements and compliance. Document internal procedures and monitoring daily reports and errors for both transformations and data communication connections. Involved in requirements analysis, planning estimation work allocation, tracking of progress against schedule, coordination with the customer, quality management, configuration management. Summary : 7+ years of experience in Production Support role along with development knowledge in Java. I worked in high-pressure production environments and adhering to quality standards. Proactively monitor the operations of the production system and help in resolving any live problems detected/reported. Production batch support, which includes monitoring batch on a rotational basis, user support, on-call support, job failure analysis and Unix system and process management. Perform various code rollouts to implement the changes done by the development team. Review the production support issues assigned and do due diligence - troubleshooting, root-cause analysis and provide resolution in a timely manner. Utilized Unix commands and shell scripting for administration, maintenance and troubleshooting. On-call production support (24x7), monitoring and maintaining multiple applications in development, QA, staging, and production environments. Experienced in planning and coordinating the Sybase data server upgrades from Sybase 12.5 to 15.7 and Sybase 15.5 to 15.7. Work on the jira tool to provide the time-to-time status of the work on the tickets related to any users in resolving their application issues within defined sla. Manage the incident process to ensure issues are recorded, tracked, resolved, and follow ups are done in a timely manner. Take ownership of issue reported by the customer and ensure that it is resolved quickly effectively or escalated to the next level with relevant data as needed in a timely manner. Set the right expectations with the customer and keep communication flowing at appropriate intervals. 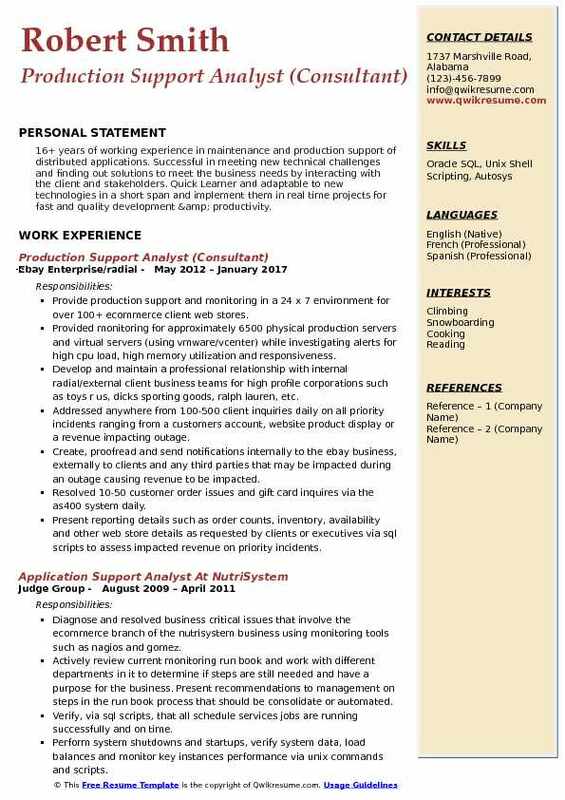 Objective : My goal is to be part of a team with an experience of over 4 years where I can continue to utilize my skills and gain in-depth experience while enhancing the companys productivity and reputation. Integrated onto the current SharePoint portal for use of vendors creating orders. Performed root cause analysis of user issues, and immediate workaround for critical problems. Ensured availability of applications as per agreed service level expectations or requirements by monitoring applications, related jobs and resolving issues. Implemented emergency changes with necessary assistance from developers and other technology teams. Provided support during new application releases into the production environment. Used jira for creating user stories and planning daily/weekly meetings. Provide third line support and handle issues/faults arising on production. Involved in application maintenance, development and support. Participated in user maintenance, break fixes, enhancements as well as gathering the business requirements. Using jams scheduler for viewing, starting, and editing various jobs concerning inventory, weekly orders, collections groups, and vendors. Headline : Software Engineer with 7 years of experience in IT industry having worked on support projects involving UNIX shell scripting, SQL, Data Stage, Autosys 4.5 and 11.3.5. Also, has support experience with Java and .Net applications. IX Possess good experience on monitoring Autosys Infrastructure and all Autosys jobs on both command and UI (WCC). Understanding the variety and complexity of the risks that are faced by the organization, effectively measuring, and managing those risks are fundamental duties of the risk management unit of an organization. Primary responsibility is to make sure the daily data is made available to the business users reporting purpose within the defined SLA. Responding to business user queries related to java application (prima) and regarding the data loads to the repository. Providing Java application (prima) access to the business users in production as well as the lower environment (uat). Troubleshooting the production nightly batch failures, user-run failures. Performing regular cleanup activities of production and lower environment file systems. Track production issues and report periodically to the group charged with monitoring uptime and efficiency of the production application. Provide knowledge articles to the level 1 group on the new/updates made to the production batch that would help them in monitoring and escalation of issues in a timely manner. Co-ordinate on the issues with various teams like ibm netezza dba’s, unix, network, application development teams and help to fix of the issue. Co-coordinating in application releases, attending meetings with the application dev and business users to help them understand regarding the production process (incident, change, and problem management). Summary : Overall 11+ years of experience in IT-Industry, with a good foundation in maintaining, monitoring, upgrading various Applications in Telecom Domain. Ability to develop a professional rapport with colleagues and clients through effective communication and coordination with a background in phone and email etiquette. Excellent organizational, analytical and problem-solving skills with effective time management. 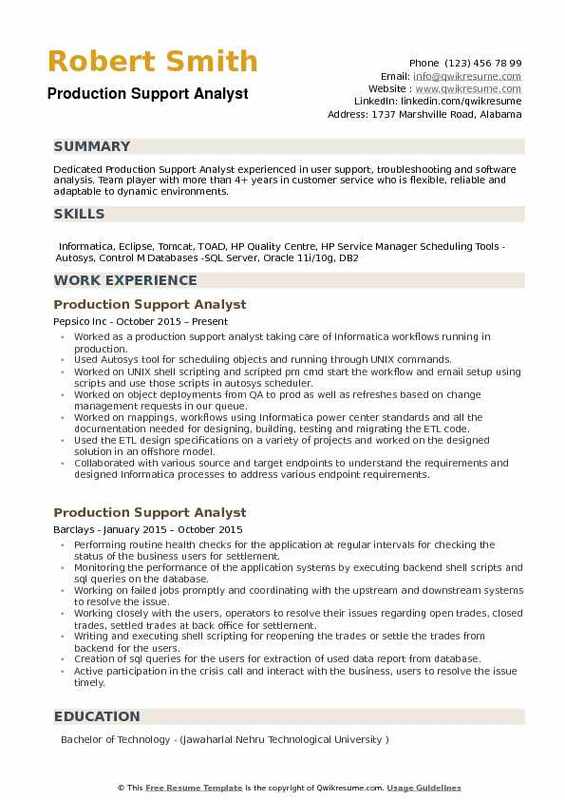 Majorly played roles are Production Support Analyst. Senior team leader providing level 1 level 2 support for the retirement services production, test and development regions in a fast-paced, demanding environment with minimal supervision. Maintained and evaluated stability with the company's Linux servers by performing ongoing health checks while providing flexibility and adaptability in handling work demands. Monitored and responded to the incident requests via ticketing management system (ServiceNow). Highly adept at troubleshooting system level and scheduling issues while providing 24/7/365 on-call support for any major incidents, outages, weekend releases and/or upgrade events; worked effectively both independently and as part of a team. Independent problem solver who troubleshoots analyzes and resolves any production batch processing failure; primary shift function is to ensure nightly batch processing begins without delays and that slas are consistently met and maintained. Closely monitored the workload automation scheduler (tws) and follows up on any scheduling items working side by side with many different departments across the business. Heavily monitored the receipt of critical pricing and trading applications to ensure client level slas. Collaborated with developers to design and implement scheduling solutions to achieve optimal results for our client base; strong communication and organizational skills. Created and maintained internal personnel documentation via the teams SharePoint site. Trained onshore and offshore resources on the Linux environment and tws to ensure operational protocols are being met. Subject matter expert in managing contingencies and disaster recovery plans in a production environment. Engaged in regular meetings with IT directors to discuss system stability for applications and operational readiness. 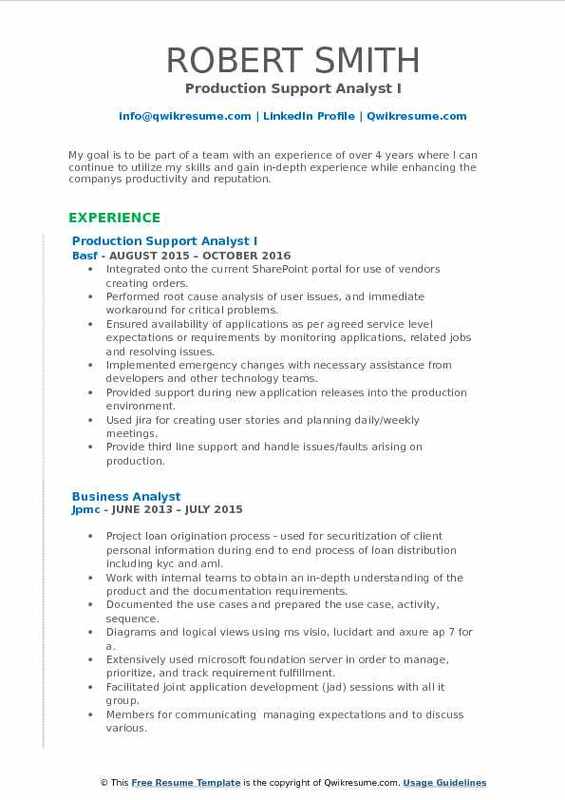 Summary : Around 10 years of experience in IT Production Support. Currently works as part of an Application/Production Support Team that provides software release, database maintenance and support to existing systems and building and implementing new systems. Maintained the production support notification system and manage issues on a daily basis. Interacted with the internal user community to facilitate the information gathering on behalf of the development team. Involved in developing ETL mappings, testing, correction, and enhancement and resolved data integrity issues. Worked with customers and third-party software vendors on file integrations and testing. Was responsible for remote disaster recovery systems and data backup and restoration. Moreover supported the windows active directory and associated user support on front-end Citrix meta-frame terminal servers. Involved on working closely with data architect to review all the conceptual, logical and physical database design models with respect to functions, definition, maintenance review and support data analysis, data quality and ETL design that feeds the logical data models. Was responsible for the kernel, release upgrades, and operating system patches. Managed network interfaces as well as Oracle database. Worked directly with senior programmers on all system enhancements and customer implementations. Worked with project manager and sales on all large customer implementations and also worked directly with large retail chains it or edi departments. 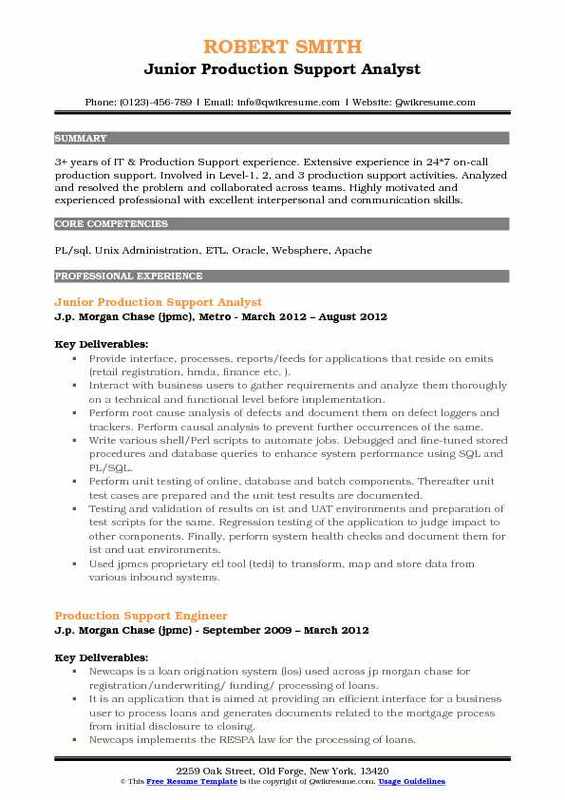 Objective : 3+ years of IT & Production Support experience. Extensive experience in 24*7 on-call production support. Involved in Level-1, 2, and 3 production support activities. Analyzed and resolved the problem and collaborated across teams. Highly motivated and experienced professional with excellent interpersonal and communication skills. Provide interface, processes, reports/feeds for applications that reside on emits (retail registration, hmda, finance etc. ). Interact with business users to gather requirements and analyze them thoroughly on a technical and functional level before implementation. Perform root cause analysis of defects and document them on defect loggers and trackers. Perform causal analysis to prevent further occurrences of the same. Write various shell/Perl scripts to automate jobs. Debugged and fine-tuned stored procedures and database queries to enhance system performance using SQL and PL/SQL. Perform unit testing of online, database and batch components. Thereafter unit test cases are prepared and the unit test results are documented. Testing and validation of results on ist and UAT environments and preparation of test scripts for the same. Regression testing of the application to judge impact to other components. Finally, perform system health checks and document them for ist and uat environments. Used jpmcs proprietary etl tool (tedi) to transform, map and store data from various inbound systems. 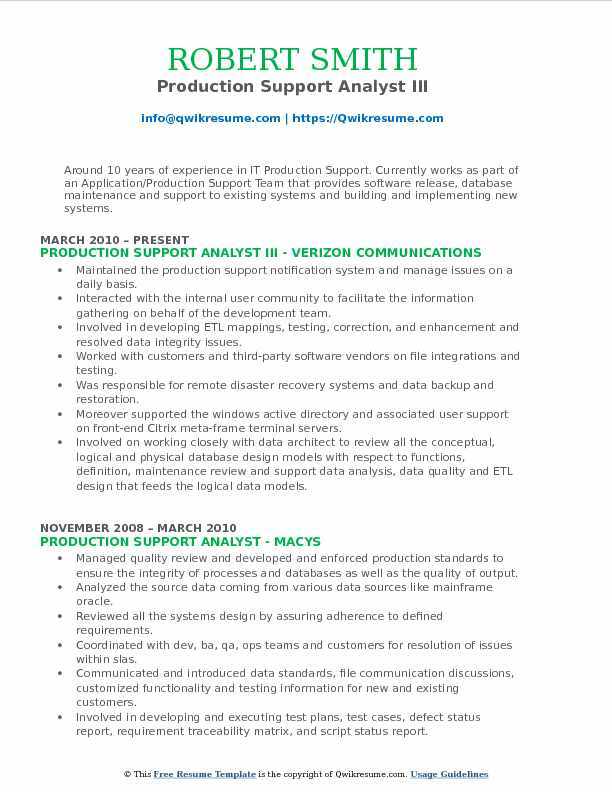 Summary : 16+ years of working experience in maintenance and production support of distributed applications. Successful in meeting new technical challenges and finding out solutions to meet the business needs by interacting with the client and stakeholders. Quick Learner and adaptable to new technologies in a short span and implement them in real time projects for fast and quality development & productivity. Provide production support and monitoring in a 24 x 7 environment for over 100+ ecommerce client web stores. Provided monitoring for approximately 6500 physical production servers and virtual servers (using vmware/vcenter) while investigating alerts for high cpu load, high memory utilization and responsiveness. Develop and maintain a professional relationship with internal radial/external client business teams for high profile corporations such as toys r us, dicks sporting goods, ralph lauren, etc. Addressed anywhere from 100-500 client inquiries daily on all priority incidents ranging from a customers account, website product display or a revenue impacting outage. Create, proofread and send notifications internally to the ebay business, externally to clients and any third parties that may be impacted during an outage causing revenue to be impacted. Resolved 10-50 customer order issues and gift card inquires via the as400 system daily. Present reporting details such as order counts, inventory, availability and other web store details as requested by clients or executives via sql scripts to assess impacted revenue on priority incidents. Monitored 100+ web stores for product availability, inventory, successful checkout, and current promotions using tools such as akamai and gomez. Schedule and facilitate bridge calls with internal resources, executive management, and clients for outages/high priority incidents which are business or revenue impacting. Incident logging for events affecting any of internal ebay enterprise systems, applications, and 3rd-party vendors. Execute linux scripts to update web store products after initial triage to alleviate revenue loss for clients. Worked directly with all third parties to communicate outages affecting the ebay business and applications. Objective : Dedicated Production Support Analyst experienced in user support, troubleshooting and software analysis. Team player with more than 4+ years in customer service who is flexible, reliable and adaptable to dynamic environments. 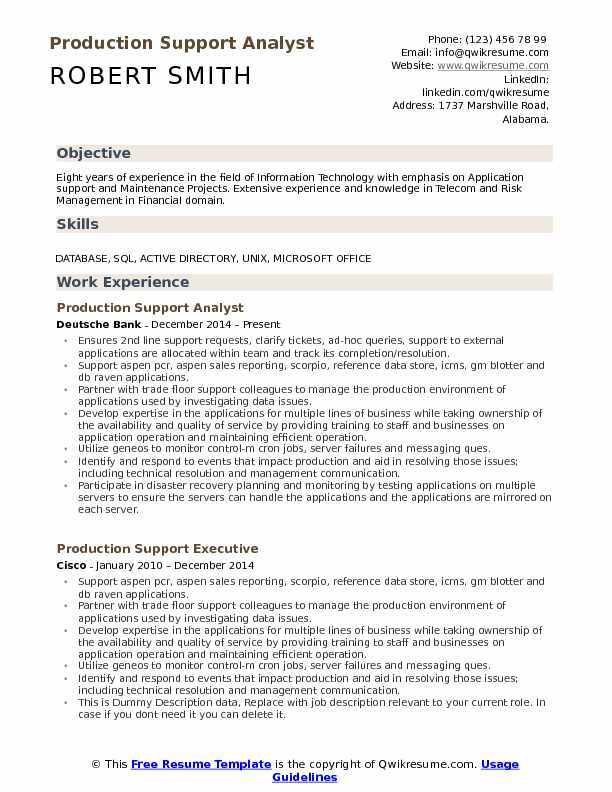 Worked as a production support analyst taking care of Informatica workflows running in production. Used Autosys tool for scheduling objects and running through UNIX commands. Worked on UNIX shell scripting and scripted pm cmd start the workflow and email setup using scripts and use those scripts in autosys scheduler. Worked on object deployments from QA to prod as well as refreshes based on change management requests in our queue. Worked on mappings, workflows using Informatica power center standards and all the documentation needed for designing, building, testing and migrating the ETL code. Used the ETL design specifications on a variety of projects and worked on the designed solution in an offshore model. Collaborated with various source and target endpoints to understand the requirements and designed Informatica processes to address various endpoint requirements. Developing complex Informatica power center workflows, worklets, sessions, mappings and re-usable mapplets using various transformations like the expression, filter, lookup, update strategy, sorter, aggregator, router, sequence generator etc. Developed sql queries and pl/sql code (procedure, function) for implementing the business logic to update the data in database.